“Well, you really do have bad eyes,” she noted while dabbing at the exquisite wakame salad accompanying her dish. “He doesn’t look a bit like Tony Blair. He is Tony Blair.” The matter settled, my unimpressed Nordic companion returned to sipping a delightful Israeli Chardonnay – one whose buttery flavor, mineral flintiness and hint of lime perfectly piqued the sashimi’s subtle tones. 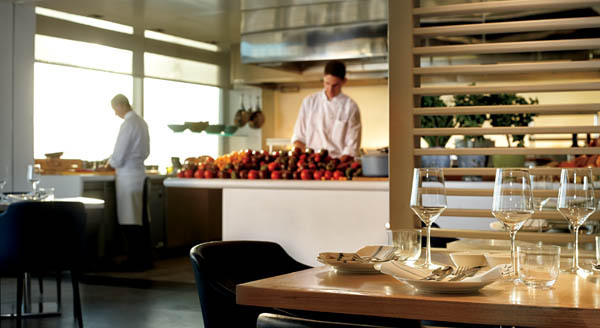 But what was Blair doing here at the Ritz-Carlton’s Herbert Samuel restaurant in Herzliya? Or, for that matter, why was he in Israel? Slightly nonplussed by my fiancé’s blasé response, I quickly busied myself with the Salmon tartar, a tantalizingly fresh and smartly seasoned dish that arrived moored against green apple, wasabi, yuzu and fennel vinaigrette. Though I had hardly taken notice of the seemingly benign little fellow with whom Tony had been sitting, I suddenly couldn’t shake the suspicion that he looked familiar. More poignantly, that I had seen him in the Gatekeepers – a documentary on the Shin Bet. At least, that’s the explanation my action-starved mind longed for. Be that as it may, the arrival of the waiter put a pause to my musings. Artichoke barigoute and Tomatoes Salad ‘Herbert Samuel,’ a house specialty, were set before us. They were accompanied by a marvelously earthy regional wine – one which my fiancé rolled, swished, swallowed and approved. Rumors. Yes, that was it. The rock band Tony Blair had belonged to in his youth. Ugly Rumours. That was the name I had been trying to remember. As for Kosher food. Rumor had it right. No, this wasn’t what Kosher tastes like. This was what the Herbert Samuel tastes like. On the few earlier occasions when I had gone to an explicitly kosher restaurant – always as a concession to an observant relative or friend – the food could at best be described as homey and wholesome. But Herbert Samuel was different. It was well-honed culinary art with an uncompromising approach to ingredients. Maximizing on local produce, the establishment employed highly skilled chefs to create the paramount in Mediterranean fusion cuisine. And the Mediterranean Wild Sea Bass and Baby Red Snapper that now arrived at our table were proof positive. Yet again, an astonishing selection of boutique wine had been recommended by the sommelier. The dishes and complementary wine were working their magic. As my fiancé took a bite of the Baby Red Snapper and baby fennels bathing in a unique pastis and tomatoes sauce, a smile erupted on her face, leaving nothing but dimples and intensely glowing eyes in its wake. I grabbed my phone to immortalize the moment and began framing the shot. But no sooner had I set up than the rebuke arrived. Caught. She noticed me arrange the angle to include Blair. “He’ll hear,” I whispered louder than intended while nervously jostling the plates. Defeat. We now had the attention of the adjacent tables. My partner glared. Though slightly flustered, I couldn’t help but notice the remarkable texture of the grilled fillet I’d been chewing on. The tomato saffron sauce together with the Swiss chard enhanced the flavors of the seabass while imbuing it with nuance. Once again, we were absorbed in the magnificence of the meal, sharing and switching dishes between us. 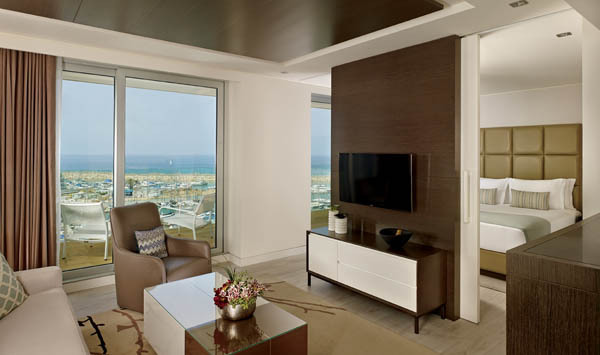 Returning to our suite at the Ritz-Carlton, Herzliya, I plugged my Ipod into the docking station and put on a Jazz compilation. Quaintly enough, it contained NY-based Israeli musicians like Rotem Sivan and Ronen Itzik. 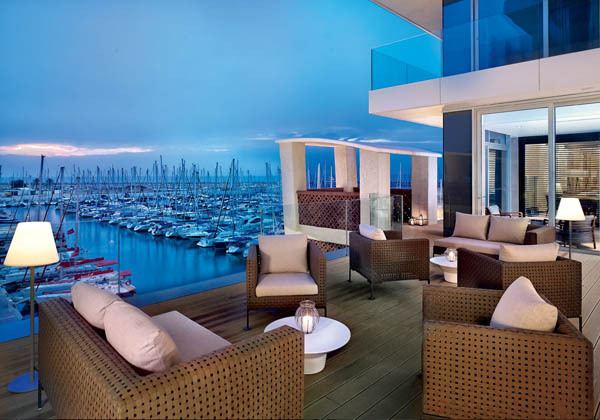 Next, we headed onto our private deck balcony overlooking Israel’s largest and most entrancing Marina. 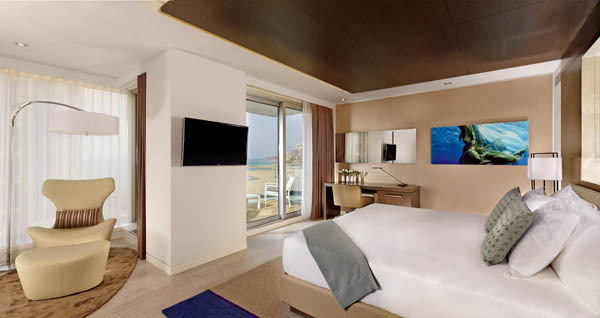 As romantic as the Mediterranean seaside was, it didn’t take long to discover the benefits of a king sized bed. We also slept well. Waking early, I downed an espresso in the Suite’s kitchen and headed for the 24-hour state-of-the-art gym (complete with ocean-view). Upon returning, I showered off while my fiancé opted for the ellipse bathtub, dousing herself in complimentary Asprey products. 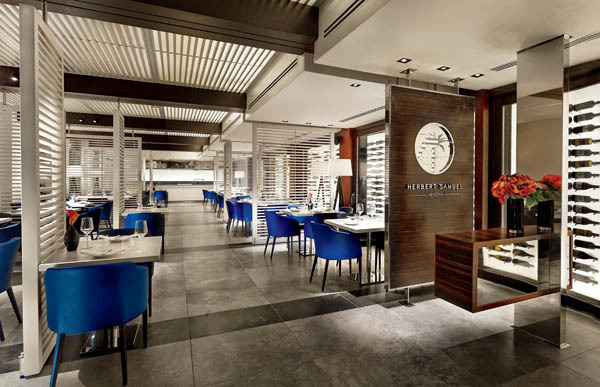 Soon, we were on our way to the Herbert Samuel for breakfast – a high-end buffet with dozens of fine cheeses, Tahini, Humus, smoked salmon, grilled fishes, meats, fresh exotic fruits, cereals, yoghurts, and pastries from which to choose. After a long seaside stroll, we took to the hotel’s breathtaking rooftop pool for cocktails. Next, we made for the Spa, jumping from Turkish Hammam to Swedish Sauna. My fiancé completed the process at the Shiseido treatment center with the renowned Dead Sea deep revival salt scrub and mud wrap. That night, after hitting Tel Aviv – only 15 minutes by cab – we stood on our suite’s balcony in robe and slippers, drinking in the view one final time. “There, look” said my fiancé facetiously, “maybe it’s me but don’t those stars reflected on the water look like long lost cousins to the ones in the sky?” Embracing her as she giggled, we toasted Tony Blair. The moon’s swollen form floated on the water, quivering in time to a sailboat that rocked by its side. Radiant, I thought. Brighter and closer than the one that lights the sky. A resplendent rumor far more wondrous than the reality of which it was born. 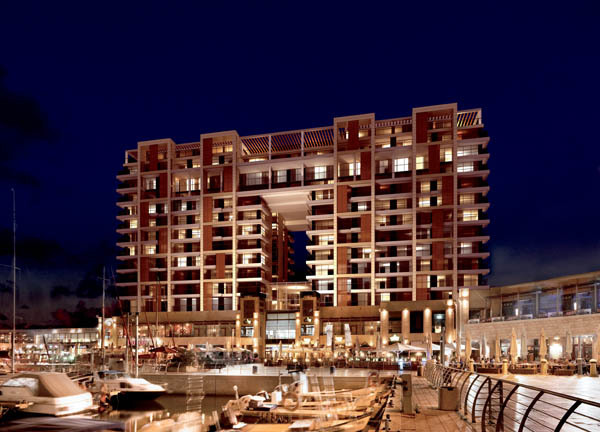 The Ritz-Carlton Herzliya like Israel itself is aspiration as much as it is construct. It is a dream that has built itself a home, a myth with a roof, a rumor with a view. Rapt in its afterglow, it is hard to forget her. 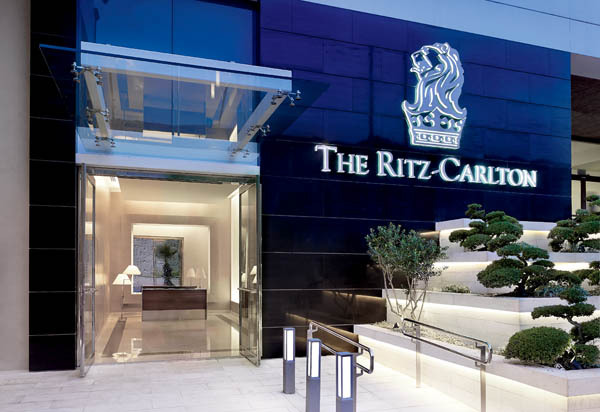 Rumor has it, anyone who’s been at the Ritz-Carlton Herzliya will be going again soon.